The article was provoked by Starkey’s reminiscing the loss of his long-term partner three years ago. Grief can do strange things to the mind. I have lost my father recently, the loss can lead you to reevaluate many things, however, it did not change my understanding of history nor has it lead to a better understanding of the past. If you did not have that understanding in the first place, then no amount of loss can compensate. Barry Coward’s book is a valuable introduction to the complex and controversial world of Oliver Cromwell. I am a little biased in my assessment of Coward since he was one of my tutors at Birkbeck during my part-time degree. I liked him as a person and a historian. But he did have a tendency to sit on the historical fence a little on the main issues of past controversies. This book on Oliver Cromwell has become a standard textbook on the period. His book is not an orthodox biography. In it, he keeps an open mind on the major issues surrounding Cromwell. He has a typical revisionist attitude towards the Putney Debates of 1647 in that he downplays them as an ideological struggle. Coward does wear his history on his sleeve and like Gaunt Coward was a paid up member of the Cromwell Association. So his biography is a little partisan, but this does not spoil the book. Being a member myself I do not subscribe to the charge that this can compromise any historical investigation into Cromwell? In The Unknown Cromwell, 1599-1642 Coward makes an important point of saying that it is good to strip away the myths surrounding Cromwell. Many of these myths and falsehoods were spread by hostile biographers. The fact that we have started to learn more about Cromwell’s early life is down to significant work by historians such as Andrew Barclay. There does seem to be some consensus that he was a gentleman, but there is a debate over his finances throughout his life. Despite its shortcomings, Coward’s biography does help one develop a correct class position of Cromwell but comes up short providing a picture of is what was going on economically around Cromwell in England. After all, he was part of a class that was experiencing extreme social and economic changes. The book is it does not actually investigate these changes. To do so would give it a far more multi-dimensional approach to Cromwell. Such an approach can be found in F.A Inderwick’s The Interregnum, 1648-60 “A complex character such as that of Cromwell, is incapable of creation, except in times of great civil and religious excitement, and one cannot judge the man without at the same time considering the contending elements by which he was surrounded. It is possible to take his character to pieces, and, selecting one or other of his qualities as a corner-stone, to build around it a monument which will show him as a patriot or a plotter, a Christian man or a hypocrite, a demon or a demi-god as the sculptor may choose”. Coward does concede that Cromwell’s political views were radicalized by Religion. He became an opponent of Charles 1st religious views. I am not sure about Coward’s assertion that Cromwell sought to complete the Reformation. Cromwell was from a very early period before hostilities had broken out opposed to the King. This included a raising a troop of soldiers and intervening in Cambridge to seize money bound for the King. Cromwell was evident as regards religion not being the only disagreement with the King when he said: “Religion was not the thing at first contested for”. If this was the case then- the question that begs being asked is what the class basis of the differences between the Independents and Presbyterians was? As Leon Trotsky said “It would seem that the conditions are now created for the single rule of the Presbyterian bourgeoisie. But before the royal power could be broken, the parliamentary army has converted itself into an independent political force. It has concentrated in its ranks the Independents the pious and resolute petty bourgeoisie, the craftsmen, and farmers. This army powerfully interferes in social life, not merely as an armed force, but as a Praetorian Guard, and as the political representative of a new class opposing the prosperous and rich bourgeoisie. Correspondingly the army creates a new state organ rising above the military command: a council of soldiers’ and officers’ deputies (“agitators”). A new period of double sovereignty has thus arrived: that of the Presbyterian Parliament and the Independents’ army. This leads to open conflicts. The bourgeoisie proves powerless to oppose with its own army the “model army” of Cromwell – that is, the armed plebeians. The battle ends with a purgation of the Presbyterian Parliament by the sword of the Independents. There remains but the rump of a parliament; the dictatorship of Cromwell is established. The lower ranks of the army, under the leadership of the Levellers – the extreme left wing of the revolution – try to oppose to the rule of the upper military levels, the patricians of the army, their own veritably plebeian regime”. The logic of Coward’s rejection of a class-based analysis of the ideological battles that occurred during the revolution leads him to make the outstanding claim that the New Model Army was not political from the outset and that it was not politicized by the Levellers. Coward says the army spontaneously gravitated to radical solutions over pay grievances etc. This downplaying of the ideological debates that took place in the military is a major weak point in the book. It is curious that Coward devotes so little to the Putney Debates. What conclusions did Cromwell draw from the debates at Putney? The dangers of a Levellers inspired mutiny against the Grandees were a real possibility. Also, another option was losing control of the New Model Army which was already to the left of Cromwell and would move against both the King and Cromwell himself if left on its own. Cromwell’s nervousness over the Levellers can be seen when they published England’s New Chains Discovered. I tell you sir; you have no other way to deal with these men [the Levellers] but to break them in pieces”. Coward centers changes Cromwell was to make regarding his thinking on exacting violence to the King was based on religious grounds. There is no denying Cromwell’s religious thinking but the explanation of the changes wracking Britain at this time was solely religious ignores the growing social and economic changes in Britain’s base and their reflection its superstructure are not mentioned. In Chapter 5 Cromwell and the Godly Reformation 1653-54 Coward outlines Cromwell move towards a military dictatorship. This was the first of its kind in Britain. On Page 96 Cowards explains following the Barebones Parliament there was a playing up of a fear of social revolution. What was the danger? Some historians have said this was exaggerated. Coward’s grand narrative is his fascination with Cromwell’s attempt at a “Godly Reformation”. Again the weakness in this book is the absence of any class analysis. What social forces were moving not just Cromwell but other players? What was Cromwell’s heritage? The fact that his name still elicits such hatred or admiration is down to the still contemporary class nature of the Civil War period. Even today there are sections of the ruling elite who still refuse to be reminded that Britain had a violent revolution which was not the British way of doing things. He has a tendency to miss a bigger picture Cowards fixation with Cromwell’s attempt at Godly Reformation misses his legacy in establishing the rule of English bourgeoisie Leon Trotsky “On this score, British workers can learn much from Cromwell. In establishing an accurate picture of the role of Cromwell one should heed the works of Karl Marx when he In the 1872 Preface to the French edition of Das Kapital Vol. 1, he emphasised that "There is no royal road to science, and only those who do not dread the fatiguing climb of its steep paths have a chance of gaining its luminous summits". Reaching a scientific understanding was hard work. Conscientious, painstaking research was required, instead of philosophical speculation and unwarranted, sweeping generalizations”. 1. Andrew Barclay. Electing Cromwell: The Making of a Politician. Political and Popular Culture in the Early Modern Period, London: Pickering and Chatto, 2011. pp. xi + 288. I first became aware of Christopher Hill in the Hilary term of 1963. Once a week for eight weeks, I and my fellow undergraduates crossed the snow-covered space between Balliol College’s lodge to its hall to hear Christopher Hill deliver a series of lectures that later formed part of his book, Society and Puritanism in Pre-Revolutionary England. Little of their content remains in my memory although I was struck by his habit of apparently sniffing every two or three sentences. I found this disconcerting. I was more impressed by his 1956 work, The Economic Problems of the Church, which I read whilst preparing an essay on the origins of the English Civil War for Roger Howell of St John’s College with whom I was studying the second half of the paper in English History up to 1714. Of the great figures in the University’s History Faculty – Hugh Trevor-Roper, J.P.Cooper, and others – Christopher Hill made the least impression on me. It was a great surprise to me when, on the point of starting my postgraduate study of the career of Robert Rich, 2nd Earl of Warwick, in the autumn of 1965, I received a letter from the History Faculty informing me that Christopher Hill had been appointed my supervisor. I viewed this choice with considerable trepidation: Christopher Hill was a Marxist, I was not: he was a specialist in Church history and the literature of the early modern period, I did not expect to be either the one or the other, at least, not much of one since my concern in ecclesiastical matters was likely to be more in the realms of patronage than in those of theology or of Church politics. He, I suspect, had concerns about me since I had been a pupil of Felix Markham and John Armstrong at Hertford College. Our meetings passed amicably enough. He had just been appointed Master of Balliol which meant he had one hundred and one things to do apart from seeing me. He did, however, use what I subsequently learnt was an old Oxford teaching technique, that of remaining completely silent in his chair in one corner of his office whilst I sat nervously in a chair facing him. This was intended to encourage me (and other pupils) to fill the silence by talking more exhaustively about my research and discoveries. I did find this a draining exercise. My unease over this procedure remained throughout my time as a postgraduate. He also invited me to a meeting of his other pupils held, to the best of my recollection, on Monday evenings in his rooms where a barrel of beer was available to those who came along with a large number of female undergraduates and postgraduates mainly from St Hilda’s college invited by his wife, Bridget. These proved to be very noisy events. Since I knew no one there, I stopped going after two or three weeks. I am afraid that both our apprehensions as postgraduate pupil and supervisor were realised. I was definitely not his kind of historian nor he mine. In the areas in which I was working, in colonial and political history, on estate management and county government, he was not equipped to help me and almost completely unfamiliar with the sources. I gravitated towards Hugh Trevor-Roper, John Cooper and Valerie Pearl. Gradually, we grew apart as I became much more critical of his approach to early modern history. The first pre-monitory tremors of revisionism were already being felt in Oxford and in the Institute of Historical Research. The intellectual parting of the ways was inevitable. After I left Oxford, I only saw him once before 1997. That was in Malet Street in London in the late-1970s. I did teach a course for the Open University in the late-1980s which he had had a large hand in designing but it was hardly recognisable as a reflection of the state of historiography by that time. I did, however, meet him and his wife again in January, 1997 when I and he had the privilege of holding Research Fellowships at The Huntington Library in San Marino, California. Our discussions were much more relaxed than they had been thirty years before. He still maintained the position that the English Revolution was a decisive turning point in the seventeenth century and the essential precondition for the emergence of capitalism on the world stage. He was just as resourceful as ever in finding literary evidence and material from the secondary sources to support his claims. But he was no less puzzled by the change in intellectual fashion that had drawn the historical audience he had once hoped to command away from him since the early-1970s and slightly annoyed by the criticism of figures like Mark Kishlansky. He was still the old Christopher Hill. His wife, however, was already concerned about how much his recent work in composing an introduction to the Calendar of State Papers Venetian had apparently taken out of him. Sadly, this was the first sign of the serious illness that was to take his life within a few years. We corresponded for a short while thereafter but, soon, neither Christopher nor Bridget could sustain such exchanges. She passed away shortly before he died in February, 2003. I am glad to have known him. He was for a period of twenty or twenty-five years one of the major figures in the historiography of early modern England. Now he is to a considerable extent forgotten as John Morrill has pointed out. Postgraduates do not, by and large, read his works any more than established historians look to him for positive guidance. That there will be a revival of interest in him and his output seems highly likely to me. Perhaps his biographer is already at work. He was, as we all are, a product of his time. That is of interest in itself. His intellectual influence may have waned but it will not be forgotten. As you would expect from a historian of Peter Gaunt’s experience and caliber, this is a book that is well written, handsomely illustrated and is the product of substantial research. The book has in general been well received both in academic circles “this book is as disciplined, vivid and vigorous as the man it celebrates. Gaunt offers a convincing interpretation of Cromwell's life and a shrewd assessment of his achievement." John Morrill, Vice Master, and Reader in Early Modern History, Selwyn College, Cambridge and in the public domain as well. "A new and controversial account of one of the pivotal figures in British history. This scholarly account is nonetheless entertaining and informative." Rachel Dickinson, Waterstones, Richmond, in the Bookseller. Having said that it should be noted that this biography is written from a particular standpoint in respect that Gaunt was a former chairman of The Cromwell Association. 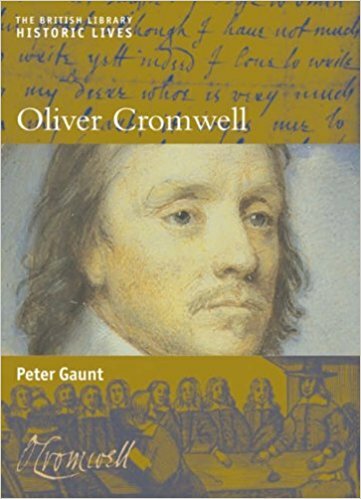 It has come in for some criticism in that it is “not a genuinely critical study.” Gaunt held that Cromwell “always retained a radical edge and never became a self-satisfied, conservative figure" (p. 9). But neither is it hagiography. Gaunt’s preface shows his tendency to wear his history on his sleeve so to speak. While it 's hard to pin down Gaunt’s support for one form of traditional school or another he does have a tendency in this book to blame Charles for the civil war in that the king was arrogant and stupid. Gaunt’s portrayal of Cromwell’s early life is carefully done. Perhaps he was mindful of the fact that it is a minefield of historical inaccuracy. Hopefully, the current work of Professor Morrill and his term working on a new edition of Cromwell’s writings and speeches will clear some of the mess up. The book acknowledges that Cromwell was a leading figure of the revolution. Cromwell was not, however, its main theoretical light. Figures such General Henry Ireton were on a much higher plane in that regard. In fact, it is high time that this ideologue of the developing bourgeoisie was given some credit for his importance to the revolution. The Putney debates form such an important part in developing an understanding of the English revolution it is, therefore, a little surprising that Gaunt pays so little attention to them in his book. The debates held at Putney proved that this was “noe mercenary armie. The debates contained discussions on Social inequality property rights and the nature of democracy. Coming to Putney, the army was split down the middle over what kind of settlement with the king was needed. The grandees or the more conservative figures around Cromwell and Ireton were in favor of compromise and issued the “Heads of proposals” (http://www.british-civil-wars.co.uk/glossary/heads-of-proposals.htm). They were as follow, the episcopacy would be retained in church government, but the power of the bishops would be substantially reduced. All Acts enforcing church attendance, the use of the Book of Common Prayer and the forbidding of holding religious meetings elsewhere would be repealed. The Covenant was to be revoked. The sitting Parliament was to set a date for its own termination. After that, biennial Parliaments were to be called (i.e. every two years), which would sit for a minimum of 120 days and maximum of 240 days.Parliamentary constituencies were to be reorganized.A Council of State would be established to conduct foreign policy. It would need Parliament's approval to make war or seek peace.Parliament was to control the appointment of state officials and officers in the army and navy for ten years.No Royalists were to hold office or stand for election, for at least five years. At the Putney Debates (October-November 1647), the Levellers issued a counter argument to the Heads of Proposals in the Agreement of the People. Despite this being rejected by Cromwell and Ireton at Putney sections in the Leveller influenced New Model Army had other ideas. Fed up with the Grandees stonewalling they moved to go against both the Presbyterians and the King in a radical and forceful way. Perhaps the most controversial aspect of the book is Guant’s attitude towards the events in Ireland. Gaunt believes that Cromwell was acting as any leading member of the new rising bourgeoisie would act. It is not in the remit of this review to go into detail. But two points should be made. Firstly Cromwell being deeply religious responded to the persecution of Protestants in Ireland (massacres did take place) with his own form of justice against the international ruling elite and sections of the population. He was reported to call them "Barbarous and bloodthirsty” Again hopefully with the publication of a new edition of Cromwell‘s speeches and writing’s edited by John Morrill we may learn the true extent of the carnage inflicted by the New Model Army. Secondly and perhaps most importantly significant economic gains were too made in the plunder of Ireland. Cromwell himself invested heavily in the colonization of Ireland. Like all historical subjects, Cromwell’s Ireland campaign is open to, in this case, heated debate. For a view that is widely representative of an Irish nationalist view, readers would do no worse than reading `God's executioner: Cromwell and the Conquest of Ireland' by Dr. Micheal O'Siochru (2008), Faber. For a counter argument to this book, please read Cromwell by Tom Reilly.